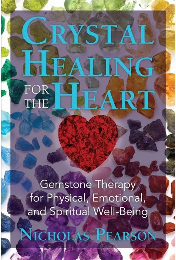 I’m here to tell you that author Nicholas Pearson has done it again with his latest book “Crystal Healing for the Heart: Gemstone Therapy for Physical, Emotional, and Spiritual Well-Being”. You may recall that back in April I reviewed Pearson’s “Crystals for Karmic Healing”. What he did for karma in that book, he does again for the heart in this one. What started as a workshop Pearson offered has evolved into a book that instructs you on how to use crystals to help with your heart. If you’re like me you probably assumed that it was going to be a big pile of love magic, but obviously (since I’m writing about it) it has so much more going on. You can follow the workshop style of the book starting at “Exploring the Heart” and “Strengthening the Heart” all the way to the with “The Awakened Heart”. You can also pick and choose your focus, although Pearson makes a strong argument for taking the systematic approach. Let me tell you what you REALLY want to know, if you’re like me. “Crystal Healing for the Heart” is loaded with beautiful, full color photos of gemstones and minerals. There are also photos of the author doing some of the exercises from the book. Whether you have an a distinct interest in the heart or not, Pearson’s book does what he does best, makes you look at crystals in new and intriguing ways. You can learn more about “Crystal Healing for the Heart” here. Previous postWhat is Perceptual Intelligence?